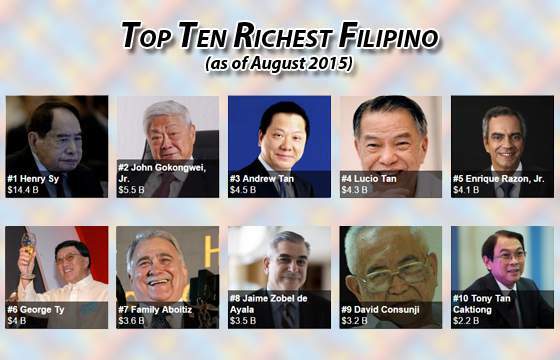 LIST: Top 50 richest Filipino (as fo August 2015) - Balita Boss! Mall tycoon Henry Sy maintained his top spot on the list of the richest Filipino with a net worth of US$14.4 billion, according to Forbes List for 2015. Here is the top richest Filipino for the year 2015. SM Investments Corporation patriarch and mall tycoon Henry Sy leads the list of 50 richest Filipinos for the eighth consecutive year, Forbes Magazine revealed on Thursday. Continue reading on Inquirer.net. For the eighth consecutive year, 90-year-old shopping mogul Henry Sy, topped the list with his net worth of $14.4 billion. He got richer by more than $2 billion from his 2014 net worth of $12.7 billion. Continue reading on PhilStar.com. Who else made the Forbes' richest list in PH? The list is dominated by familiar names in the country's business scene, but this year's edition of the Philippines' 50 richest also welcomed newly-minted billionaires. Continue reading on Rappler.com.